and Norman Snider, based on the book Twins by Bari Wood and Jack Geasland; photography: Peter Suschitzky; editor: Ronald Sanders; music: Howard Shore; art director: James McAteer; production designer: Carol Spier; sound: Bryan Day; costumes: Denise Cronenberg; special effects design: Gordon Smith. Cast: Jeremy Irons ( Beverly Mantle/Elliot Mantle ); Geneviève Bujold ( Claire Niveau ); Stephen Lack ( Anders Wolleck ); Heidi von Palleske ( Cary ); Shirley Douglas ( Laura ); Barbara Gordon ( Danuta ); Nick Nichols ( Leo ); Lynn Cormack ( Arlene ); Damir Andrei ( Birchall ); Miriam Newhouse ( Mrs. Bookman ). Moorman, David, David Cronenberg: A Horror Filmer in Transformation , Rotterdam, 1990. Cronenberg, David, Cronenberg on Cronenberg , London, 1992. Shaviro, Steven, The Cinematic Body , Minneapolis and London, 1993. Parker, Andrew, "Grafting David Cronenberg," in Media Spectacles edited by Marjorie Garber and others, New York and London, 1993. Morris, Peter, David Cronenberg: A Delicate Balance , Milford, 1994. Jaehne, Karen, "Double Trouble," in Film Comment (New York), September 1988. Variety (New York), 7 September 1988. Gleiberman, O., "Cronenberg's Double Meanings," in American Film (Marion), October 1988. Elia, M., Séquences (Paris), November 1988. Lee, N., "Visuals for Dead Ringers Inspire Belief," in American Cinematographer (New York), December 1988. Beauchamp, M., "Frères de sang," in 24 Images (Montreal), Winter 1988–89. Stanbrook, A., "Cronenberg's Creative Cancers," in Sight and Sound (London), Winter 1988–89. Baron, A.-M., Cinéma (Paris), January 1989. Bunbury, S., "David Cronenberg Doubles Up," in Cinema Papers (Melbourne), January 1989. Cook, P., and A. Billson, Monthly Film Bulletin (London), January 1989. Garcia, M., Films in Review (New York), January 1989. Katsahnias, I., and others, "La beauté intérieure," in Cahiers du Cinéma (Paris), February 1989. Dadoun, R., "L'épouvante intérieure ou Qu'est-ce que l'homme a dans le ventre," in Positif (Paris), March 1989. Ramasse, F., and others, "La chair dans l'âme," in Positif (Paris), March 1989. Ross, P., Revue du Cinéma (Paris), March 1989. Kay. S., "Double or Nothing," in Cinema Papers (Melbourne), July 1989. Nguyen, D. T., "The Projectile Movie Revisited," in Film Criticism (Meadville, Pennsylvania), Spring 1990. Creed, B., "Phallic Panic: Male Hysteria and Dead Ringers ," in Screen (London), Summer 1990. Breskin, David, "David Cronenberg: The Rolling Stone Interview," in Rolling Stone (New York), 6 February 1992. Winnert, Derek, "Doctor in Double Trouble," in Radio Times (London), 30 May 1992. "Special Issue," Post Script (Commerce), vol. 15, no. 2, Winter-Spring 1996. Lucas, Tim, and John Charles, in Video Watchdog (Cincinnati), no. 36, 1996. Since his first commercial film Shivers premiered in the early seventies, David Cronenberg has been saddled with the confining stereotype best exemplified in the nickname the "Baron of Blood." With subsequent films such as Rabid , Scanners , and The Fly Cronenberg has kept this reputation intact and his films rather foreboding to those uninitiated to the Cronenberg vision. With three films in the early 1990s ( Dead Ringers , Naked Lunch , and M. Butterfly ) however, Cronenberg departed from the conventional science-fiction/horror brand of cinema he has been known for. Dead Ringers is Cronenberg's first attempt at a conventional, tragic, human drama. The film functions in this respect so well that one is left emotionally drained and extremely melancholic after viewing it. In Cronenberg on Cronenberg , the director describes the film as follows: "[It] has to do with that element of being human. It has to do with this ineffable sadness that is an element of human existence." The production saga of Dead Ringers began when Cronenberg first saw a headline that read something like, "Twin Docs Found Dead in Posh Pad" and decided that it was a story worth telling. "It was too perfect," the director has since said. In 1981, the project began its gestation when Carol Baum approached Cronenberg with the vague idea of doing a film about twins. Although they initially differed on subject matter they eventually settled on the story of Stewart and Cyril Marcus, twin gynecologists who, as the above headlines stated, were found dead, the perpetrators of a joint suicide. Cronenberg next read a book loosely based on the twins called, appropriately enough, Twins , by Bari Wood and Jack Geasland (the name of the film would later be changed from Twins to Dead Ringers prior to release at the request of Cronenberg's old colleague Ivan Reitman so as not to clash with the Arnold Schwarzenegger comedy vehicle). Baum and Cronenberg then enlisted producer Sylvio Tabet and chose Norman Snider to write a script. The script Snider produced however was found unacceptable to Cronenberg due to Snider's attempt to fit too much of the book into the script (Cronenberg wanted as little of the book as possible) and a re-write was commissioned. Tabet's reservations about the rewritten script killed the project at this time however and, in 1982, it seemed as though the film would never be made. Two years later, Cronenberg along with producer Mark Boyman tried to raise interest in the project once again. But, the project was to be met less than enthusiastically, with the main complaint being along the lines of: "Do they have to be gynecologists? Couldn't they be lawyers?" This question signalled to Cronenberg the inability of the studio executives to "get it," so the search for financial backing continued with Cronenberg directing The Fly (1986) in the interim. It was eventually Dino De Laurentiis's DEG company (the company that had produced The Dead Zone ) that took on the project. Unfortunately, the De Laurentiis group went bankrupt shortly after agreeing to produce and Cronenberg Productions was left to produce the film independently. 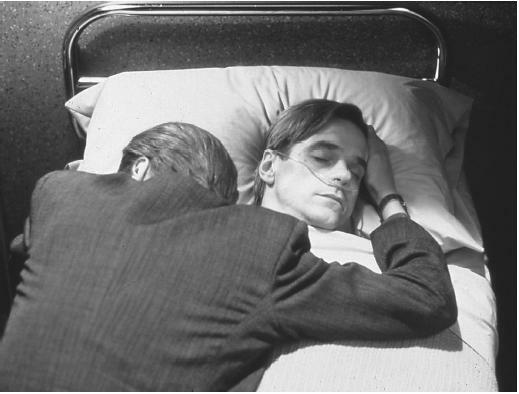 Dead Ringers is the tragedy of identical twin gynecologists Beverly and Elliot Mantle (both played by Jeremy Irons). The Mantles are wunderkind doctors from Toronto who operate the famous Mantle fertility clinic where actress Claire Niveau (Geneviève Bujold) comes seeking advice on how she can become pregnant. Unfortunately, Claire is diagnosed as "trifurcate" (possession of three cervixes—a "mutant" woman) and incapable of bearing children. That evening, Elliot sleeps with Claire and then, in keeping with the twins' sharing of everything, urges Beverly to take his place the following night. Beverly, however, falls in love with Claire until, upon learning of the deception, Claire ends the ruse by refusing to see either of them. Beverly's descent begins here and he becomes addicted to both alcohol and drugs. Following a reunion with Claire, Beverly becomes insanely jealous when she leaves for a shoot and mistakenly believes she is having an affair then falls further into his drug induced depression. Elliot, who has been out of town pursuing his own career, returns to supervise his brother's detoxification but ultimately gives up when Beverly commissions the creation of gynecological instruments for operating on mutant women and uses them on actual patients, consequently destroying the clinic's reputation and the twins' practice. Elliot, in an effort to restore the perfect equilibrium they shared before they met Claire, then tries to synchronize their drug taking and keeps Beverly locked up until Claire returns and he goes to her. A week later, Claire reluctantly allows Beverly to return to his brother who has descended even further than Beverly had. The twins now lock themselves up in the clinic and gradually regress until Beverly operates on Elliot to "separate" them and kills him. Beverly then calls Claire but cannot speak and returns to the clinic and dies silently while lying across Elliot's body. A major concern embedded in Dead Ringers is the notion of control. Cronenberg acknowledges this in the following way in Cronenberg on Cronenberg: "The whole concept of free will resists the idea of anything determining destiny. Freedom of choice rests on the premise of freedom from physical and material restrictions." The Mantles are the device Cronenberg uses "to investigate that, not as an aberration but as cases in point of genetic power." In fact, the twins have little control over their own lives until the end of the film. Cronenberg consciously constructed their world and lighted it in such a way that it resembles an enormous aquarium wherein the twins are nothing more than inhabitants who consistently run through the monotony of a fragile daily existence. The twins' synchronized world is so fragile in fact that the introduction of Claire as something the twins refuse to share completely decimates them. It is only through death that the twins assert their free will and attain the control they have lacked throughout the film. Therefore, suicide becomes the only instance in the twins' life in which they exert complete control over the outcome and sever the bizarre biological link to destiny. Although Dead Ringers is a classic story of control, problems with analyzing it as such arise when categorizing that control. The determination of who is controlling who is an endless conundrum within the film. For example, the twins control Claire (who functions as a sort of symbolic representation of women) through gynecology by understanding her body in ways she cannot (Cronenberg's purely narrative construction of mutant women and instruments for operating on them is indicative of this control). At the same time, however, Claire wields control over the twins by using the same device in the guise of her sexuality. It is Claire who, through her control of Beverly, dictates the demise of the twins. The omnipresent nature of control in the film is ultimately its tragedy—you can't escape control. This tragedy erupts from the concept that biology is destiny. Cronenberg succeeds in questioning this theory while at the same time subscribing to it by suggesting that the concept of free will is the destroyer of destiny. That is, while the brothers' profession as gynecologists allows them to control biology to a certain degree, it is death that ultimately triumphs, although they still maintain a certain amount of control over that. Beginning with Dead Ringers , Cronenberg has made films which seem to suggest that he has abandoned his hybrid-horror child and adopted a more cerebral and suspenseful and less sci-fi narrative style. The maturity with which these films address the Cronenbergian concerns of biological control of destiny and usurpation of that control illustrates that the new Cronenberg film is indeed grounded more in the realm of dramatic tragedy and less in either science fiction or horror.